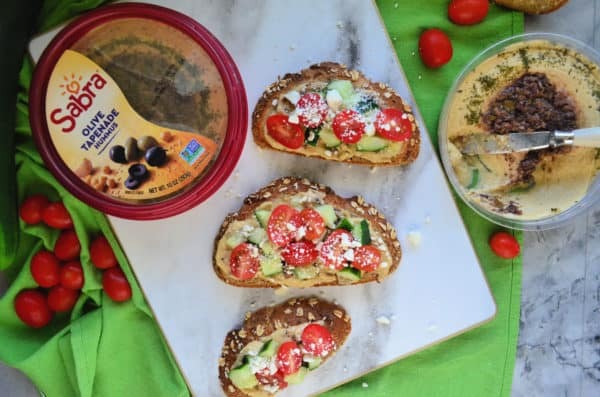 Thank you Sabra for sponsoring today’s recipe. As always, all opinions are my own. Hummus Toast. It’s a thing. A delicious thing that I can’t stop gobbling up every morning for a quick and healthy breakfast. I even have my young kids hook on my Mediterranean Hummus Toast. I always struggle for quick low-dairy breakfast options. 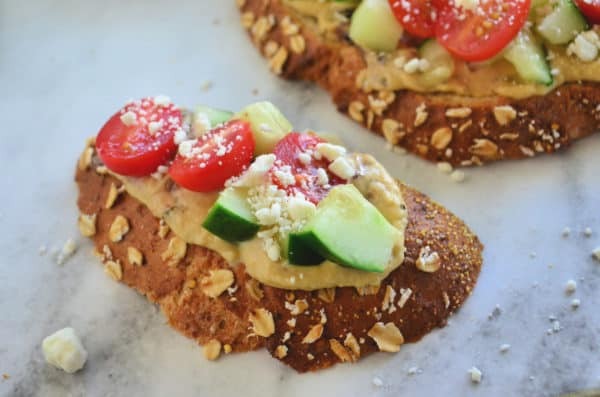 Hummus toast has been the answer for a filling and satisfying quick breakfast I can inhaling before I’m rushing out the door to take my son to school. I know that Sabra has a Greek-Inspired Hummus flavor; however, I can rarely find it at my local grocery store. The one flavor I can always find is the Olive Tapenade Hummus. If you come to my house, and look into my refrigerator you’ll always see at least one tub of the Olive Tapenade Hummus. It’s one of my favorite flavors. 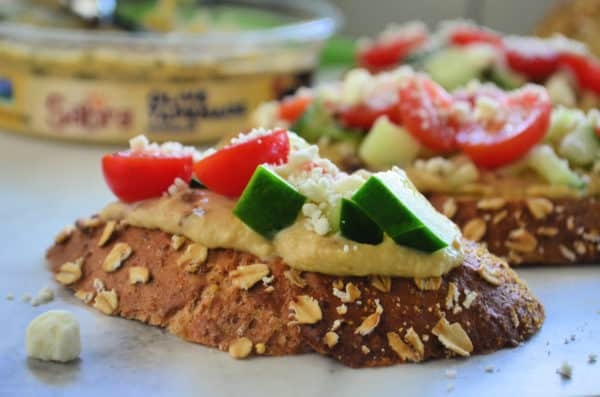 I figured it would be perfect for this Greek Inspired Hummus Toast. Of course, if you can find the Greek-Inspired flavor feel free to use that too. I love to eat veggies. Some might find it odd in the morning, but to me it makes this hummus toast complete. How do you make hummus toast? Making hummus toast is very easy and only takes a few minutes to put it together. Five ingredients to be exact. First, you’ll want a whole wheat oat bread. While it’s toasting you can prep the veggies. Or prep all the veggies at once (the day before or even that day and store the rest of the veggies in an air-tight container in the refrigerator). Then, once the toast is done toasting you’ll start by slathering on a hearty helping of hummus. Next, sprinkle on the diced cucumbers, sliced tomatoes, and sprinkle on a little feta. *If you have a little fresh dill you can sprinkle some chopped on top. But not necessary if it’s not readily available. Once you’ve constructed one slice of toast. You will repeat until you have all your slices made. Then, it’s time to enjoy the toast. I typically only eat one slice. It’s loaded with hummus and veggies and fills me perfectly. 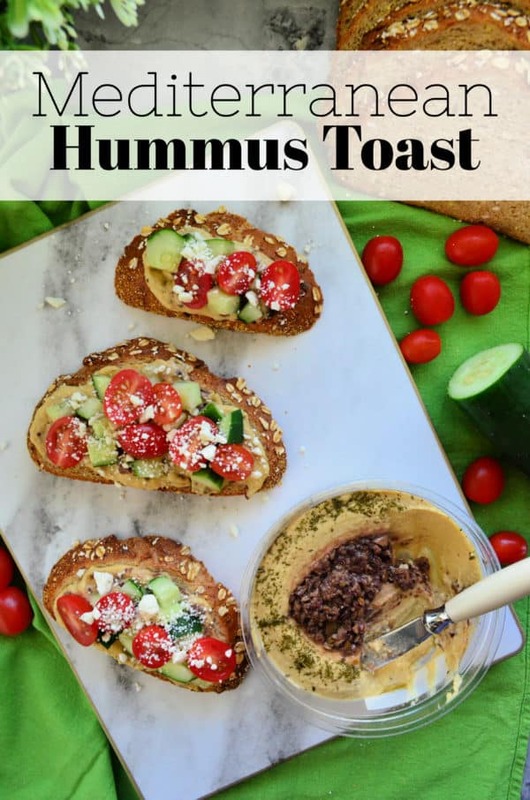 If your looking to switch up your breakfast routine… I highly suggest you give my recipe for Mediterranean Hummus Toast a try! Start by prepping the vegetables; clean and chop/slice and set to the side. Toast whole wheat oat bread until golden. 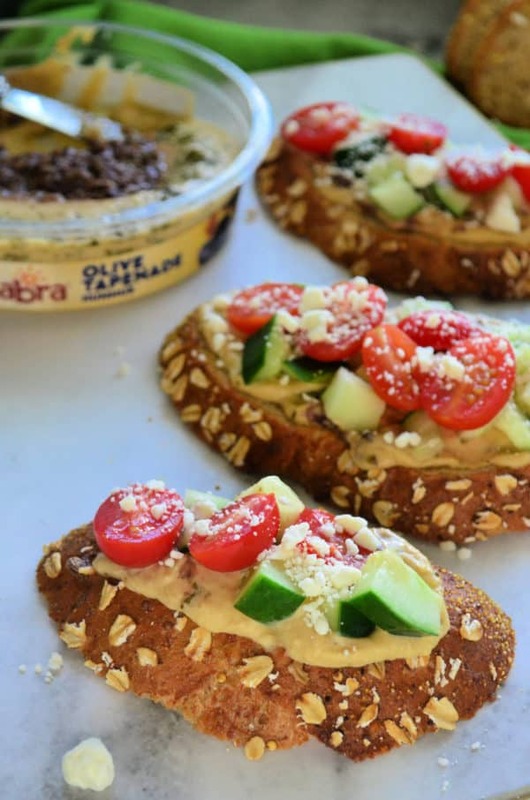 Remove from toaster, slather on 2 tablespoons of Sabra Olive Tapenade Hummus on to each slice. Next, add the diced cucumbers and sliced grape tomatoes. Sprinkle on the feta, repeat, and enjoy until all the toast is made.